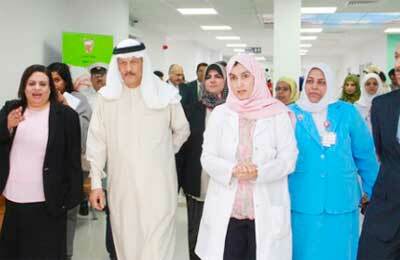 Bahrain’s main hospital has increased the outpatient capacity of its Accident and Emergency department by 400 per cent. The BD31,000 ($81,757) expansion at Salmaniya Medical Complex (SMC) was officially opened yesterday (November 25) by Health Minister Sadiq Al Shehabi and will open to the public from today, said a report in the Gulf Daily News (GDN), our sister publication. It includes a bigger waiting area, three private triage rooms, a pharmacy and a reception and is staffed with 30 nurses and 12 doctors per shift. "This expansion will make a major difference, mainly in terms of patient comfort, which is reducing the waiting hours," Al Shehabi told the GDN. "No patient coming to the emergency department will now have to wait because there are three triage rooms, ready with staff to receive them. "Until now the emergency department could only receive 50 patients at a time, but now that will be 250 patients." He added that an expansion of the car park was also being planned. "This is set for 2015 and we cannot spell out a date now, but we will be working on it as a priority," he said. The GDN reported in August that infrastructure projects worth more than BD15 million were underway at SMC, which includes the BD5.6m multi-storey car park, a BD6m power station and a BD4m outpatient clinic. SMC accident and emergency chairwoman and emergency paediatric consultant Dr Khadeeja Farooq Jamal said the expanded emergency department had dedicated facilities for Sickle Cell Disease (SCD) patients. "There will be a separate triage for the SCD patients and they will not need to wait as there will also be an assigned nurse to attend to them," she said. "The triage works on a system that the patient will be taken for a check-up in private to decide whether the case is hot or cold and depending on this the patient will be guided further. "In SCD cases they will be referred to the haematology centre in case they need emergency attention. "In the other cases, patients whose condition is regular or not an emergency will be referred back to the health centres, while those who can wait will be asked to do so." Health Ministry Hospital Affairs assistant under-secretary Dr Waleed Al Manea said the new system would help organise the accident and emergency department. "SMC's Accident and Emergency department receives around 800 cases a day, of which at least 40 per cent don't have to be there, but could be treated at the health centres," he said. "Hence these triages will now be helpful to decide quickly whether they should be referred back to the health centres or otherwise."